I have been anxiously awaiting the reappearance of fava beans to our local farmer’s markets. Though you may have little company fighting their way to the bins of fava, don’t let your memories of one of the most creepy scenes in movie history keep you from trying what is one of the greatest gifts of the summer harvest! Fava beans (also known as broad beans) are very popular in European, Persian and African cooking. They haven’t really caught on in the US (probably due to the rather laborious process for preparing the bean. I have to admit, I am amused that these complaints don’t seem to accompany eating lobster or crab…though I admit that, on the surface, they are way more tempting than the peculiar fava bean. This recipe is inspired by a delicious appetizer I had at a local pizza joint. 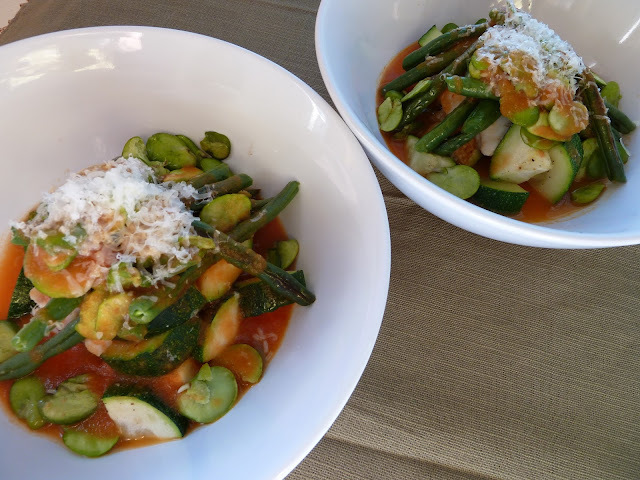 It was so simple and celebrated common summer veggies, including green beans. Resting in a pool of a tomato sauce that was just the right combination of sweet, rich and acidic, it took only one bite for me to proclaim that I would attempt to replicate the dish at home. (I love when that happens!). I did take some liberty with the dish (I added zucchini and cod to make it a more substantial main-dish worthy meal). Otherwise, I tried to stay pretty true to the simple spirit of the dish. While the preparation of the fava beans will take some time, the rest of the dish is pretty simple and straight forward. Omit the fish and double the rest of the recipe to make a yummy vegetarian main course. It would make a great summer dinner party or Sunday supper meal. 5. Place the shelled fava beans in a bowl, drizzle with a couple of teaspoons of canola oil, sprinkle with salt and pepper. Toss to combine. Lay even portions of the tomato sauce in the bottom of four shallow bowls, leaving enough to drizzle over the top of the finished dish. 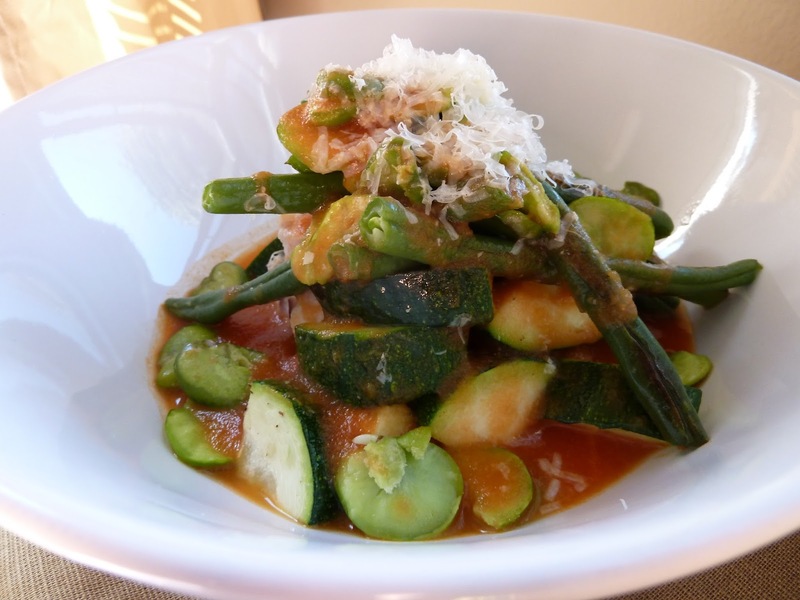 Top with fish portion then the roasted zucchini, green beans and fava beans. Top with a couple spoonfuls of the sauce and, if you’re feeling crazy and want to break the culinary rule of no cheese on fish, sprinkle with a little freshly grated Parmesan cheese.